Poverty-related illness is a major cause of absenteeism and early school drop-out. Yet despite high rates of illness and disease among students, schools are unarmed to deal with these problems. We are proud to be working to improve schools’ basic medical response. In Uganda, a child that is sick at school is often sent home. However, for families of vulnerable children, they often don’t know how or have the resources to seek medical attention for their child. All too often, children sent home simply do not return to school or if they do, they are still unwell and begin the slide into chronic absenteeism. Common reasons for high absenteeism or drop-out include malaria, digestive illnesses resulting from unclean food and water, respiratory illnesses, fungal infections that are spread among siblings living in close proximity, and burns from cooking or abuse. Many girls don’t attend school when they are menstruating, due to a lack of access to sanitary products or latrines. Schools are also not well equipped to deal with emergencies – either accidents that happen at school or when children are so sick they must receive immediate medical attention. Our four-phase program helps schools develop capacity to administer first aid and other basic medical treatment, create a systems of referral and follow-up, and promote health information and health literacy, aimed at improving children’s health and wellbeing and ability to succeed in school. Establish a safe place where children can seek help. Schools dedicate space to establish a basic sick bay and teachers volunteer to receive training on first aid and how to administer health information. Linkages to nearby government clinics are established where teachers can refer children who can receive treatment at little or no cost. It is through this work and the resulting documentation and analysis that schools learn the illnesses that affect their students most. Scale training to other educators. In this phase, the trained teachers train other educators under the supervision of i.HUG’s partners. The initial thrust of the training includes first aid training, education on how to prevent accidents at school, how to administer basic treatment and follow-up, and when to refer to government clinics. As part of this phase, a health day for parents is held to inform them of the school’s work and how they can help their children stay healthy. Empower students to help other students. Students can help other students live healthier lives and stay in school. Leading students volunteer for training and then can promote health information among their peers. These peer mentors, starting with girls, can educate girls on health and hygiene related to menstruation or may organize health events for the school on topics including preventing accidents and healthy lifestyles. Make it sustainable. By training an appropriate number of teachers, schools ensure educators aren’t overly taxed and there is staff available to address students’ health needs, without taking on extra expenses. Meanwhile, school administrators can best direct whatever budget they do so it has a maximum impact on the student body. 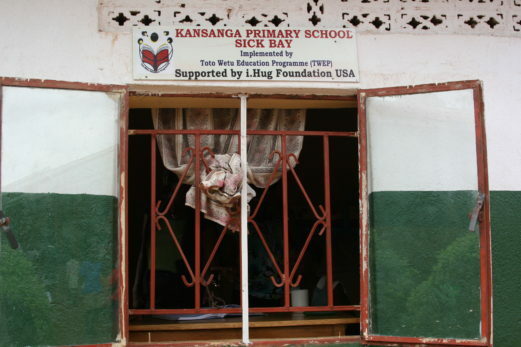 Once schools successfully complete the roll-out, they are folded into i.HUG’s network, receiving additional training, coaching, and if available, additional medical supplies. Additional progress is expected as the partner school continues to roll out the project.